Open floor plans continue to reign. Eighty-four percent of builders say that in the typical single-family home they build, the kitchen and family room arrangement is at least partially open. Fifty-four percent say it's completely open, according to responses from a September 2016 National Association of Home Builders/Wells Fargo Housing Market Index. "Completely open" essentially means the two areas are combined into the same room. Partially open signifies areas separated by a partial wall, arch, counter, or something less than a full wall. It's 2017. Now what? Yes, the new year is typically a time for hope and renewal and for those who are looking to sell - and simultaneously buy - a home, it can represent a fresh start. But this year, political and social realities are giving some would-be home sellers pause. Thankfully, the real estate market continues to show real strength, with many housing experts projecting home sales prices and inventory to rise in 2017, replacing doubts with consumer confidence. 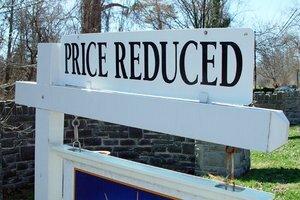 "Housing prices rose nationally by around 6% in 2016, but the expected increase in 2017 ranges from 3% to 5%," said 24/7 Wall St. "With inventory of existing homes at historic lows and a rise in interest rates thanks to the Federal Reserve, housing inventory for 2017 is almost certain to rise. For prospective sellers that means that if you were planning to sell your home this year, it's time to get cracking." If you're selling your home to buy another, like most people, you might be concerned about rising mortgage rates. Rates are still near historic lows despite The Fed raising interest rates at the end of 2016 and indicating that further increases are in store for this year. "Because the mortgage rate makes a big difference in how much you'll pay for your home, it makes financial sense to shop around for the lowest rate you can qualify for," said Investopedia. But many people don't look beyond the first offer. According to a mortgage borrowers survey, "Almost half of borrowers seriously consider only a single lender or broker before deciding where to apply," and "Seventy-seven percent of borrowers only end up applying with a single lender or broker, instead of filling out applications with multiple lenders or brokers to see which can offer the best deal," said the Consumer Financial Protection Bureau. Asking your real estate agent for a few different trusted referrals could make a big difference. "Getting an interest rate of 4.0% instead of 4.5% translates into approximately $60 savings per month," they said. "Over the first five years, you would save about $3,500 in mortgage payments. In addition, the lower interest rate means that you'd pay off an additional $1,400 in principal in the first five years, even while making lower payments." It's more important than ever to make sure your home is as close to perfect as possible before you put it on the market. Unless your agent is planning to market the home as a "project," it needs to be spotless. You'd be surprised how much better your home can look just by applying some simple staging secrets. 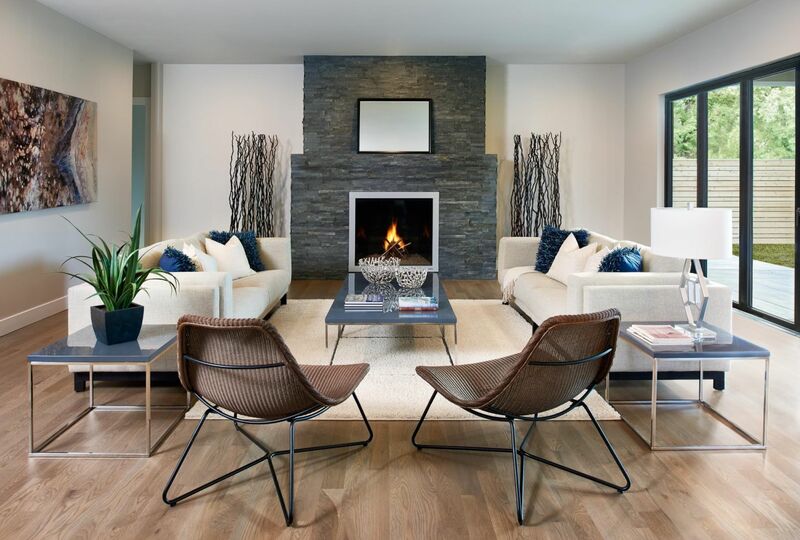 Staging may only be the beginning of what your home requires to get it sold, and your agent's advice will be critical to getting it where it needs to be. "Sure, you no doubt know more about your home than anyone else. But your real estate agent knows more about how to sell it," said Realtor.com. "And your agent may make some suggestions you might not like to hear. It's tempting to take offense or just ignore this advice, but if you do, you could risk seeing your house sit on the market and grow stale." "Dying to install new kitchen cabinets or retile your master bath? Home sellers often assume any upgrades they make to their home will pay them back in full once they sell, but that's rarely the case," said Realtor.com. "On average you will recoup just about 64% of the money you spend on renovations once you sell—and certain improvements can actually work against you if they're unusual or undesirable in your market, Jason Shepherd, co-founder of Atlas Real Estate Group, told them. Extended family descending on your house this year? Don't panic. If you start now, you can have a holiday-ready home by the time Aunt Brenda and her brood shows up. "We say it every year - the holidays will be here before we know it," said Prime Lending. "For many people, that means hosting parties, welcoming overnight guests and opening your home to unexpected drop-in visitors. You may be thinking it would be great to spruce things up around your house before the holiday hustle and bustle begins. Now is a great time to dive into your home makeover and wrap it up before the holidays arrive." Here are the areas you might want to focus on first. Chances are, your kitchen is going to be one of the places where people are congregating during the holidays, and not just while cooking. If it's seen better days, or if it just doesn't reflect your style - or any style from this century - get started. You can select, order, and have new countertops installed in a matter of a few weeks. If you don't want to touch the countertops, think about painting your cabinets and adding new hardware. A new backsplash can bring it all together, and is something you can do yourself. Thinking about the function of your kitchen - not just how you'll use it over the holidays, but all year round - is key to making good choices when renovating. "If you are hosting Thanksgiving, a double oven and a new refrigerator may be your top priority," said Prime Lending. Maybe your dishwasher has seen better days or your washer and dryer have been hanging on for a while. Knowing that they'll be put to good use with a house full of people might inspire you to make some upgrades now. While you're in the kitchen, you may want to think about upgrading your cookware, cooking utensils, glassware, silverware, and anything else that will be helping you prepare, serve, or eat food during the holidays. How old are those dishes, anyway? If you have clunky built-ins or a large armoire housing your outdated TV, it might be time to make some changes. Turn the built-ins into bookcases or a sleek desk with some streamlined shelving above, which can provide both function and a fashionable upgrade. 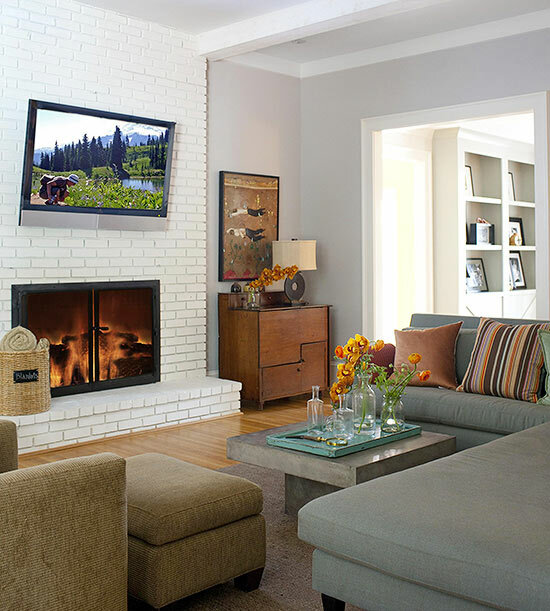 Turn a fireplace into a focal point by re-tiling or simply painting old brick white and hang a flat screen above. Voila. Your hangout space is updated and holiday-ready. If you're not super tech-savvy and have never installed a flat screen before, it's smart to hire someone who is and who has. "If a new flat panel television, home theatre system, or other electronic devices are bound for your household this gift-giving season, consider seeking installation quotes from a trained professional," said Better Homes and Gardens. "Proper installation can maximize your enjoyment of new electronics for a fraction of their purchase price, and the stress of following a multi-page instruction manual may bring out the Scrooge in many DIYers." You can make the guests rooms (or the guest couches, if your family converging on one house for the holidays looks anything like ours) hospitable and improve the look at the same time by changing out the bedding. Buying new sheets and a comforter is easy and inexpensive - and don't forget new pillows, too. Choose a neutral color for the comforter and add some patterned pillow for some zip. Or, choose a graphic pattern to give the bed a modern feel. A fresh coat of paint in a color that is neutral and that gives the rooms a calming nature will help transform them into something that feels resort-like. If you live in a climate that allows outdoor enjoyment throughout the year - or if you know the kids will be playing outside regardless of the temperature - making some changes in your yard might be in order. The fall is a great time to buy patio furniture, since it's typically on sale after summer ends. A fire pit can be an inviting addition to your outdoor area, and one that will allow your guests to gather in front of a crackling fire while bundled up with a tasty, holiday beverage. One thing you can count on is that your guests will be spending time in the bathrooms. If yours are in need of some attention, now's the time to pay some. If you don't want to do a complete overhaul, you can make simple, inexpensive edits by changing out the showerhead, faucets, lighting, and slathering on a fresh coat of paint. A new paint color and some new hardware can also liven up older cabinets. Add a fresh set of towels and bath mats, and you're all set. Do a complete walk-through of your house. Turn on all the baths, sinks, and showers, and all the lights and TVs. Sit on the beds, couches, and chairs. Open closets. Search the walls, doors, and baseboards for nicks and scratches. This will give you a head start on anything that needs to be fixed or replaced before family starts knocking on the door. A lot of sellers don’t listen to their real estate agents, so we’ll tell you what your agent wants to say, but can’t say to you and this is it – your agent can’t get you the price you want unless your home is in pristine move-in condition. That means no sticking drawers in the kitchen. No leaning fences. No rust-stained plumbing fixtures. We could go on, but maybe we need to make it clear. If you have even one of following “turn-offs,” your home won’t sell. 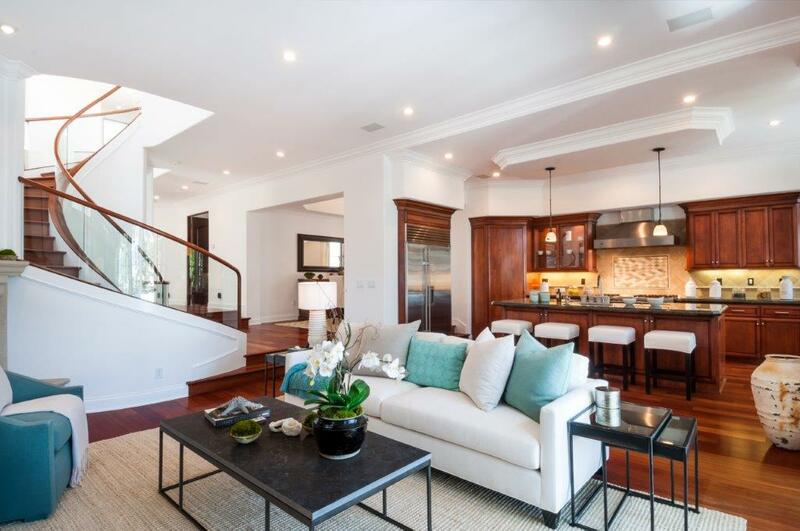 If your tables are full to the edges with photos, figurines, mail, and drinking glasses, buyers’ attention is going to more focused on running the gauntlet of your living room without breaking any Hummels than in considering your home for purchase. Often times our spare bedrooms end up being untouched spaces or unofficial storage units where all of our miscellaneous belongs get shipped off to. Creating a space for houseguests that is inviting while still versatile for your needs when no one is visiting can be a bit of a challenge, but with a few simple touches you can ensure your guest bedroom is no longer an underutilized area of the home. Your first step is to clear the clutter. This is especially true when guests are due to arrive soon. Investing in storage boxes and bins for your personal items ensures you won’t need to clear all of your belongs each time someone visits and it also keeps the room airy and appealing for your guests. You also don’t need to settle on boring and unstylish plastic storage bins either. Here are some inspiration photos for storage containers that can add a stylish flare to any room: http://www.pinterest.com/rlsenn/storage-containers/. Check out this unique storage idea for utilizing the space under your bed:http://www.pinterest.com/pin/83527768060324674/. Having trouble organizing your closet trinkets? Take a look at this organizational idea:http://www.pinterest.com/pin/48976714667186686/.